Madhya Pradesh Cricket Association gave up their hosting rights before the second ODI, on October 24, was shifted from Indore to Visakhapatnam. File Image of Chennai's Chepauk Stadium. 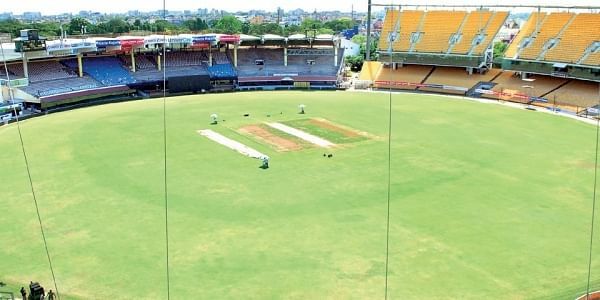 HYDERABAD: The third T20 International between India and West Indies, scheduled in Chennai on November 4, will be held as per schedule after the Committee of Administrators accepted the Tamil Nadu Cricket Association's request of sticking to the old formula on complimentary tickets. "We are awaiting a confirmation mail from the BCCI and I can tell you that match will be happening in Chennai. There had been extensive discussions and COA has understood our rationale behind sticking to the old formula of membership passes. It's a great news for cricket lovers in Chennai," a TNCA official told PTI Thursday. Cricket Association of Bengal (CAB) president Sourav Ganguly was also unhappy with the arrangement after which it was decided that the membership tickets will not be counted in the 10 percent category and BCCI will also forego 600 out of 1200 passes. "CAB has also sent its consent letter and signed the match agreement," a BCCI official said.